Mingun is a small town in central Myanmar (formerly Burma). It sits on the banks of the Irrawaddy River, northwest of the city of Mandalay. It's known for the Mingun Pahtodawgyi, an immense, unfinished pagoda. Nearby, the Mingun Bell is a colossal bronze bell from the early 19th century. 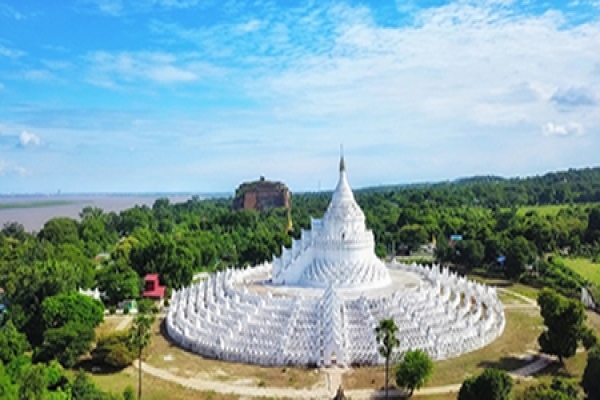 To the north, the striking, white Hsinbyume Pagoda is defined by its wavy, tiered terraces and is crowned by a large stupa. Private Boat Sightseeing to (Mingun).